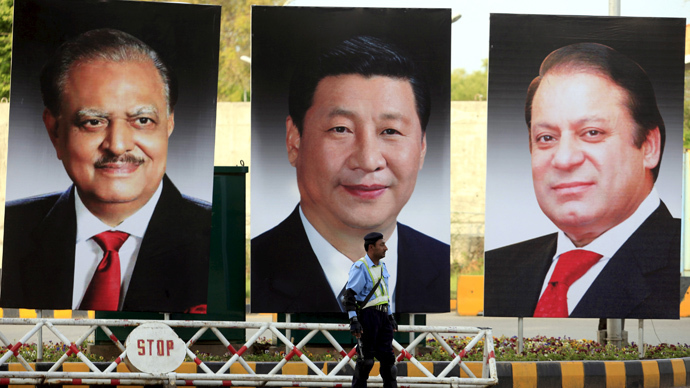 Chinese President Xi Jinping has arrived in Pakistan on Monday on his first visit to the country in nearly a decade. He is reportedly going to announce a $46 billion investment in energy and infrastructure. China is expected to invest about $34 billion into energy projects and nearly $12 billion into infrastructure, with the main part of the investment to focus on the so-called China-Pakistan Economic Corridor (CPEC), according to the media reports. Beijing considers CPEC, a network of roads, railways and pipelines, as an opportunity to expand its trade and transport links and boost economic influence across Central and South Asia. Deals worth some $28 billion are ready to be signed during the visit, with the rest to follow. “The real opportunity of this China-Pakistan Economic Corridor is that it changes the scope of the relationship from geopolitics to geoeconomics,” the Pakistani minister overseeing the investment projects, Ahsan Iqbal was cited as saying by The Guardian. Though China and Pakistan have had close diplomatic and military ties for decades, economic links only started growing recently. Trade between the two countries was $12 billion last year, compared with $2 billion a decade ago. Pakistan is facing a problem of chronic power shortages, and hopes the investment will boost its economy and help curb the energy crisis. Some $15.5 billion worth of coal, wind, solar and hydroelectric projects will come online with Chinese help by 2017, according to officials. The two countries will “cooperate in natural gas, coal, and solar energy projects that will provide 16,400 megawatts of electricity which is roughly equivalent to the country’s entire current capacity,” according to Iqbal. The creation of road, rail and pipeline links that will cut several thousand kilometers off the transport route for oil from the Middle East to China, bypassing rival India is also one of the aspects of the investment project. The network is to stretch 3,000km from the Pakistani port of Gwadar on the Arabian Sea to the western Chinese city of Kashgar. Another deal on the so-called ‘Peace Pipeline’, a natural gas pipeline from Iran to Pakistan, is also expected to be signed during the Chinese President’s two-day state visit. The 1045 mile (1682km) pipeline which was proposed some 20 years ago will transfer gas from Iran’s south to the Pakistani cities of Gwadar and Nawabshah. China will provide $2 billion needed to build the Pakistani stretch while the 560-mile portion of the pipeline that runs to the Pakistan border is already complete. On Friday, the Chinese Foreign Ministry said the projects in Pakistan would be the first initiatives of the $40 billion Silk Road Economic Belt and Maritime Silk Road, an ambitious network of roads, rails and ports designed to link China to Europe through Central Asia and Russia which was announced by China’s President in November. By investing into the Pakistani economy, China hopes to prevent the spread of militant groups from Pakistan into the far western region of Xinjiang, which has a large Muslim population. In 2010, the US provided an assistance package worth $5 billon to Pakistan to stabilize the country during the war in Afghanistan. However, most of it went to non-government sectors and the rest to American companies. Pakistan is more optimistic about the forthcoming Chinese investment. “The roads and rail links will help us integrate the three engines of growth in Asia: South Asia, Central Asia and China. Pakistan will become the economic hub of the region,” said Pakistani Minister Ashan Iqbal.